Dame Sue Black is an internationally renowned forensic anthropologist and human anatomist. She has lived her life eye to eye with the Grim Reaper, and she writes vividly about it in this book, which is part primer on the basics of identifying human remains, part frank memoir of a woman whose first paying job as a schoolgirl was to apprentice in a butcher shop, and part no-nonsense but deeply humane introduction to the reality of death in our lives. It is a treat for CSI junkies, murder mystery and thriller readers, and anyone seeking a clear-eyed guide to a subject that touches us all. Cutting through hype, romanticism, and cliché, she recounts her first dissection; her own first acquaintance with a loved one’s death; the mortal remains in her lab and at burial sites as well as scenes of violence, murder, and criminal dismemberment; and about investigating mass fatalities due to war, accident, or natural disaster, such as the 2004 Indian Ocean tsunami. 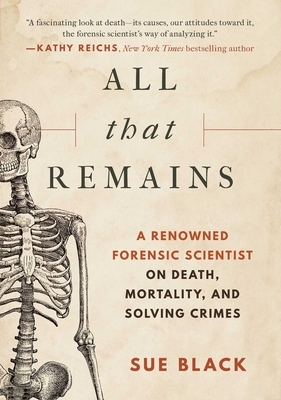 She uses key cases to reveal how forensic science has developed and what her work has taught her about human nature. Sue Black, DBE, FRSE, is the Director of the Centre for Anatomy and Human Identification, the Leverhulme Research Centre for Forensic Science at the University of Dundee, Scotland. Her forensic expertise has been crucial to solving high-profile criminal cases. In 1999, she was the lead anthropologist for the British Forensics Team's work in the war crimes investigations in Kosovo and she worked in Thailand after the 2004 Indian Ocean tsunami. She makes regular appearances on radio and television. She lives near Dundee, Scotland.